You know how I love my Jim Lahey pizza crust. How it has revolutionized pizza night in our house. How it is so easy to make that even someone who has never baked before can figure it out in about two seconds. Well, sometimes easy doesn’t translate to quick (the crust takes two un-manned hours to rise) and sometimes, revolution has to wait until Saturday. Which is why last week, my grand plans to make an arugula and prosciutto pizza on Lahey crust got derailed when I caught a glimpse of whole wheat Naan in my freezer. Why turn the oven to 500°F for 30 minutes on a 95° day? 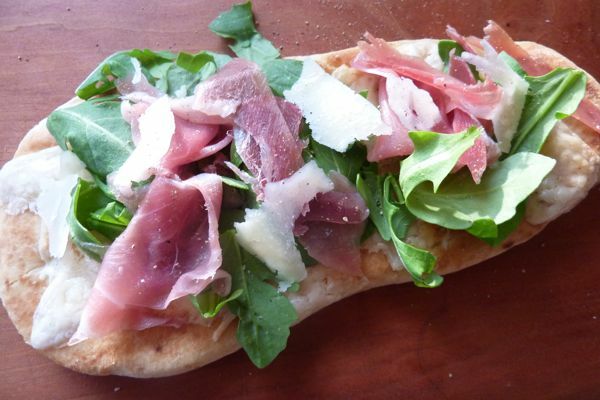 Flatbread pizza takes five minutes and if you happen to have a 42-inch arugula-hater in the house, the meal can be easily repositioned as ham and cheese. Toast or broil four pieces of flatbread (or Naan) until golden. Remove and flip over. Add a handful of shredded Italian fontina (or mozzarella) to each untoasted side and return to the toaster or broiler until cheese is bubbly, about 2-3 minutes. When the toasts are ready, top with bunches of fresh loosely packed arugula, a few pieces of thinly-sliced prosciutto, some shaved or shredded Parmesan, a few twists of freshly ground pepper, and a drizzle of olive oil. Arugula and Proscuitto are like Pb and J…yet so much more grown up, shall we say! Love your site and will make sure to include on MyInspirationLounge.com under Cook & Entertain! So glad Ingrid! And the fig move is genius. I have a big carton of them in my refrigerator right now so will be following your lead. We love this! Thanks, Jenny. Also, the leftover naan was used the next day for a waffle maker grilled cheese sandwich. Youm!